No-see-ums are small biting insects that appear primarily during the summer months. They are barely visible to the naked eye, but their bites can be very painful. Most outdoor enthusiasts have experienced them. Smaller insects known as no-see-ums in Florida sometimes can fly through the holes of regular fiberglass screen (18 x 14 mesh). The No-See-Um or 20x20 screen offers superior insect protection to a standard 18/14 screen. With a more tightly woven screen pattern, small insects simply can’t fit through and so - they go elsewhere. The more finely woven 20x20 screen still allows good ventilation with an added level of bug resistance. 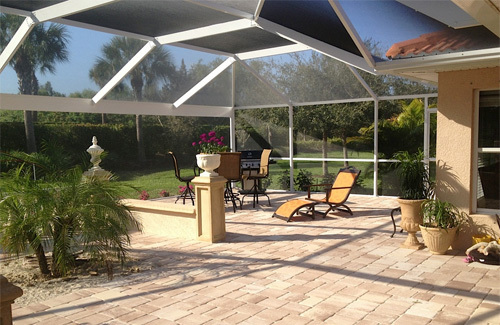 The 20/20 Insect Screen is the ideal choice for large patio enclosures and for pool enclosures – call Premier today for a consultation!